The way to spend a wonderful time is not only in Ireland but studying here you gives you the opportunity to visit other Europe countries at weekends and holidays. Ireland has the Dublin Airport, which is a hub connecting with many other countries for reasonable prices. If I visit Germany from Japan, it would cost approximately seven times more compared to the flights from here to Germany. I can’t miss out this opportunity as long as I’m living in Ireland. 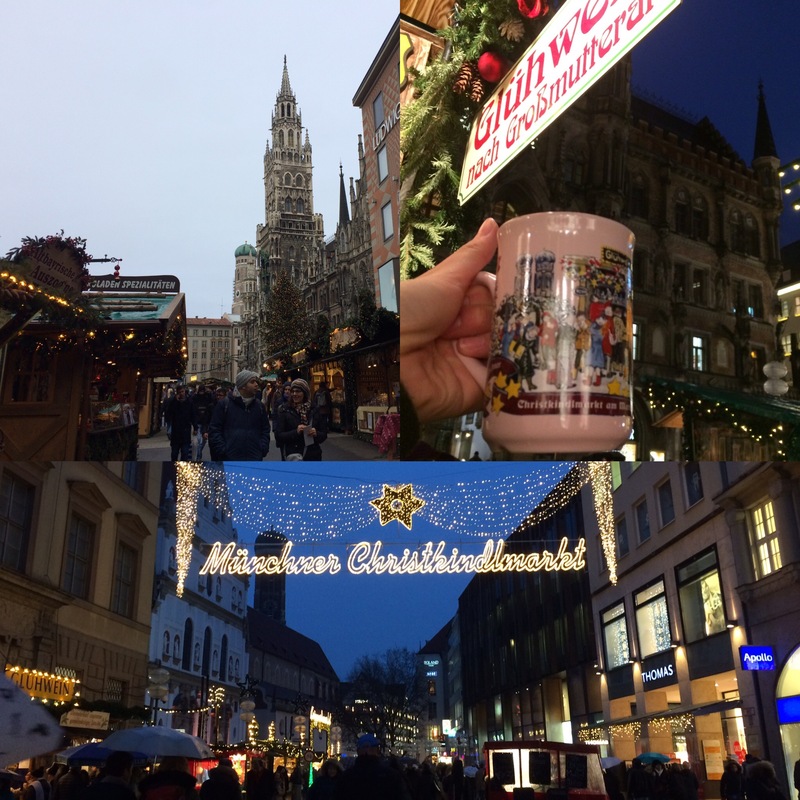 During my winter holidays, I visited three German cities, Munich, Augsburg and Rothenburg. The latter two cities are two of the cities which are along with ‘The Romantic Road’. 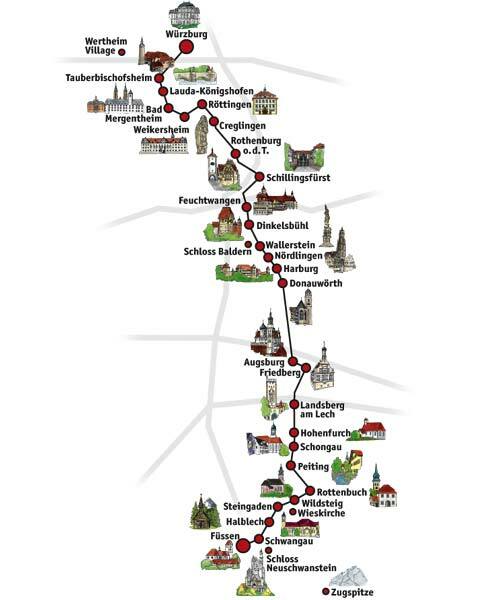 Here’s the map of the route, with all the cities included ‘The Romantic Road.’. The Romantic Road was originally known as a trade route during the middle ages, but these days most of its visitors are tourists visiting medieval and historical sites and exploring beautiful scenery and culture. As most of you guys may know, Munich is a very famous large city in Germany, like Berlin. The Munich Christmas market called “Christkindlmarkt” is held in front of Munich Town Hall in the heart of the city centre. It was literary a touristy market with tons of tourists. The market was larger than I expected, and it made me indecisive as there were so much delightful stalls to choose from. We tried ‘Bratwrust’ (a typical German grilled sausage) for the first time. Of course, we didn’t forget to warm ourselves up with a cup of Gluhwein as well! It made us choosy because each stalls selling hot wine have different designs of glasses. As you guys may know, we can keep the cup after drinking. I’m sure that the cup will be a lovely souvenir to remind me of the wonderful time at the Christmas market. Augsburg is among the oldest cities in Germany with a history going back 2,000 years and is known as an angel’s city. 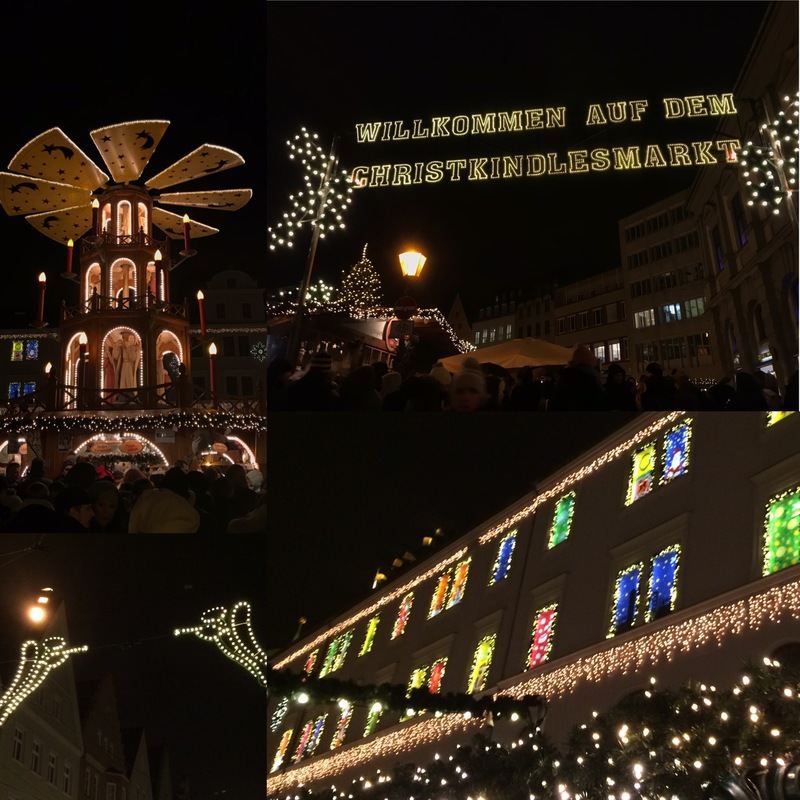 Although the market there was smaller than that of Munich, but it was absolutely beautiful with a huge Christmas tree, a few embellishments shaped like an angel and lots of the colourful pictures of decorated patrician homes. After we walked around the town and took in a good view over a couple of hours, we tried some traditional food at the market. The market was swamped with tourists and every stall had a long queue. I reckoned this Christmas market was by far the most crowded market comparing the other two Christmas markets. 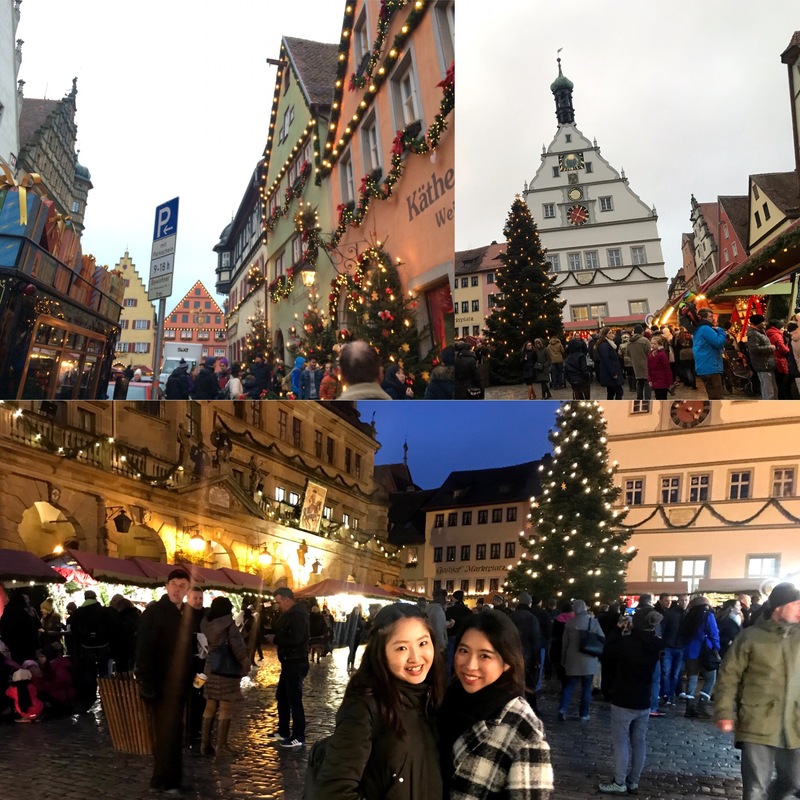 Rothenburg is the perfect place to enjoy a Christmassy and picturesque atmosphere. It has a lot to offer visitors, including charming medieval scenery, tons of places to eat and shop, some interesting museums (e.g. the Punishment Museum and German Christmas Museum) and so on. It’s very busy and touristy, but worth it as the town itself is absolutely beautiful. Interestingly, this small city is still encircled by walls built for defence from invaders in the past. We were literally enchanted because the views from the city’s walls are magnificent. The Christmas market, offering up a romantic and cozy vibes was also amazing. The real Santa sometimes came to the market and he entertained us with a musical box. And sure, there are also many vendors selling German food. One of the foods that I’d like to introduce is Schneeball which means snowball in German. They are very popular around Rothenburg. They look like strips of pastry rolled into a ball, with a diameter of about ten centimeters. There are many different flavours ranging from loose sugar, chocolate-grazed and marzipan. Surprisingly, it has a long shelf life – it lasts for two months without refrigeration! I spent a dreamlike and memorable time in Germany during my holiday. Each city has a tremendous amount of appeal and the splendor of its magnificent city. 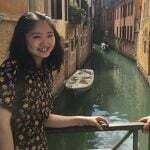 I’m really happy to have the opportunity to explore the different cultures of Europe countries whilst studying in Ireland.